Warning: this post contains material pertaining to bottoms. If you are easily offended, or just want something more delicious than what I'm offering today, I suggest you click on to the the next blog. Bottoms, also known as buns, are the topic of the day. But if I said buns, then you'd go looking for a tantalizing bread product, preferably dripping with sugar and cinnamon. Now that I've got your mind on that track, check out this post, then join me back here. You back, cinnamon roll in hand? Good. Now we can get to the bottom of today's issue. Buns. I mean bottoms. Most people probably don't think about bottoms much. Unless you're trying on jeans, or working out, or at the pool, or ice skating (I tend to fall down a lot), or....OK, maybe people do think about bottoms a fair amount. But the people who think about buns a whole lot are new parents. Doing diaper changes every couple of hours (or minutes, depending on the little one) gives a concerned parent the opportunity to assess the state of their child's buns all day long. Are they smooth and healthy or are they covered in an unsightly, painful rash? As a new parent I didn't know any better than what advertising told me, so when my precious little bundle of joy got a bad diaper rash, I reached for the Desitin. People, that stuff is nasty. It's basically zinc oxide. It stuck to his poor, fragile skin and to the diaper, so when I next changed the diaper, it pulled off a layer of skin. Ouch! It made a painful problem much, much worse! After that horrible experience I did some searching for natural alternatives and found a wonderful ointment made with herbs. It soothed, it healed, and it didn't have any nasty chemicals in it. But it was also expensive. So I set about trying to make my own version. The main ingredient in the ointment is comfrey. Comfrey is a member of the plant family known as "weed." But a useful weed. It contains allantoin, a cell proliferant (meaning it encourages cells to grow and spread). For blistered buns, this means swift healing. Hooray! Now comes the part of the post where you get angry at me. I've sold you on comfrey and now you want to know where to get it. Well, I get mine in my sister's back yard. Her house used to be owned by a naturopath who grew a medicinal herbal garden. Plus, due to a stream running through the property, local regulations mandate that no chemicals be used in the yard. So it's organic, plentiful, and cheap! If you do an online search, there are several places that sell organic comfrey seeds. If you don't have the space or inclination to grow your own, you can also order comfrey oil. But that can be spendy. Finding your own source and making your own is the thriftiest way to go. 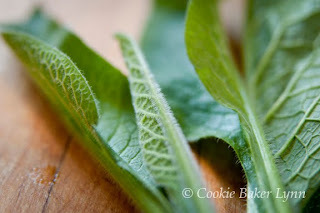 Once you've located comfrey, you need to turn it into comfrey oil. This is so easy, it's ridiculous. You soak it in oil. That's it. Then you add whatever thickening and soothing agents you'd like, and, hey, presto, Bun Goobies! Bun Goobies? Yes, we like to name things weird names. We also like to make up lyrics to known tunes and possibly sing them at diaper changing time. Here, as an added bonus for today's post, are the lyrics to the diaper changing song, sung to this tune. Rinse and towel dry the comfrey. 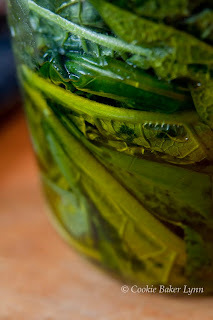 Into a clean jar (I like to use a quart canning jar), cram as much of the comfrey in as you can. Pour the olive oil into the jar slowly, allowing it settle into the spaces between the leaves. It's important to keep the leaves submerged under the oil. Leaves that aren't covered can start to mold. If that happens, you'll need to toss it all and start over. To prevent that from happening, place a well-washed stone on top of the leaves to keep them from bobbing up above the surface. Also, filling the jar to the top with oil discourages mold growth. Place the jar in the sun and leave it there for one to two weeks (depending on how warm it is). If sun is unavailable to you (hello Northwest weather), you can place it in a food dehydrator or an oven on low for 4-24 hours. When the oil is done it will be green with a strong, funky smell. Funky like comfrey and oil, not funky like decay. Line a sieve with cheesecloth and place it over a bowl. Pour the oil into it and allow it to drain into the bowl. The first time, just allow gravity to do all the work. This is the first "pressing". Set that oil aside. For the second "pressing," use a wooden spoon to mash the leaves, pressing all the oil out that you can. This results in a darker oil, but it's still good. 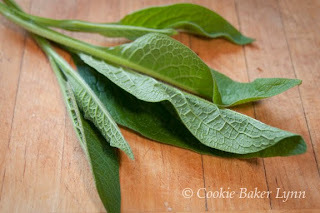 Throw the comfrey leaves onto your compost heap. In a saucepan over low heat gently heat the oil. 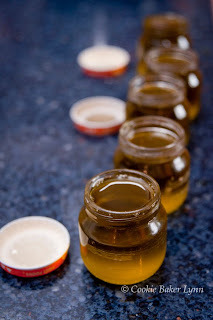 To each cup of oil, add 1/4 cup of grated beeswax. Stir until the wax is melted. At this point you can add any of the optional oils. Be aware that adding extra oils will change the consistency and you might need to increase the amount of beeswax that you use. Check for proper firmness by placing one tablespoon of the mixture in the freezer for just a minute or two. Test the firmness and adjust if necessary. To make it firmer, add more beeswax; to make it softer, add more oil. When you're satisfied with the consistency, remove the salve mixture from heat and immediately pour into clean baby food jars. Label and store in a cool dark place. It will last for months, even years. It's an awesome baby shower gift and it's also useful as an all-around first aid ointment. * You can make calendula oil the same way as the comfrey oil, if you have access to organic calendula. I recommend growing your own. They're a lovely, cheerful flower, and the petals make a very soothing oil. You know that's really interesting - I have a wild weed salve from Naturokits that is basically various "weeds" in olive oil and beeswax. So fairly similar. The interesting part is that my 7 yr old BEGS me to use that stuff in particular even over our (white) calendula and arnica cream for scrapes and boo-boos because she claims it doesn't sting. "Is it the brown stuff mommy? Phew, Okay!" There's more than just something to be said for natural remedies, that's for sure! Thanks for this!! I know what I'm going to look for at the organic garden center down the road now! I love that the name of the comforting herb is comfrey. I just looked in The Harrowsmith Illustrated Book of Herbs by Patrick Lima and particularly like the following excerpt: "Popular old names such as knitbone, bruisewort, boneset and healing herb tll that comfrey once figured in poultices for sprains, swellings, burns and bruises." The other cool thing about comfrey is that "comfrey leaves contain such high concentrations of soluble plant foods that the foliage can be brewed - one part leaves in three parts water - and left to steep for a week, to concoct a potash-rich green manure "tea" for watering tomatoes, root crops and cucumber or squash vines. Suddenly I wish I had a little baby bottom to put this on, just so I could sing Neal Sedaka's famous 'Gooby Bun' song to him/her. Maybe grandkids are in my future now that my daughter is actually engaged. Did you use your, um, bun goobies, while using cloth diapers? I'm always hesitant to use any kind of ointments on my baby's bottom because cloth diapers can repel pee if they get oily build up from diaper creams. Otherwise, this sounds great! Hobby Baker - Natural all the way! Elizabeth - Thanks for the great tip for insect bites! I'm going to have to try this the next time the mosquitoes feast. Baking Soda - I've ruined many a song for my kids. You, me, and Weird Al, we can be awesome together. Katie - I'm a cloth diaper all the way kind of gal. I never had any kind of problem with buildup in the diapers. The bun goobies washed right out. That song is almost endearing enough to convince me to get diaper rash :). And your title is quite punny :). Bun Goobies makes me giggle.